Compaq Presario CQ70 Windows XP PRO Laptop Computer, Dual, 3GB, 80GB, READY! The Panasonic Toughbook CF-19 is a convertible-style computer that can be used as either a classic fully-rugged laptop or the screen can be rotated and folded flat into a rugged tablet. Encased in a Magnesium-alloy case. NO webcam. TOSHIBA L675D 17.3" 500GB, AMD PHENOM II 2.90GHz, 4GB Win 7 (#152937792130). Works GOOD. There a slight scratches on the back cover and front bezel; the palm rest shows minimal signs of use. AMD Athlon(tm) 64 X 2 Dual-Core Processor TK-57 (2 CPUs)1.90 GHz. 320GB Hard Drive. Genuine AC Dell Adapter Included. This Laptop have space for 2 Hard Drive only ONE on it right now. The device is all cleaned up, tested, and ready for your information. Clean install of Windows 7 pro 32 bit with all drivers loaded. Serial numbers are recorded. Hard Drive: 120GB SSD & 750GB Sata. Graphic Card: Gforce GTX 560M 3GB. This is internet ready, Wifi works great. TOSHIBA L675D 17.3" 500GB, AMD PHENOM II 2.90GHz, 4GB Win 7 (#152937792130). Works GOOD. There are very slight scratches on the back cover. The bezel and the palm rest shows signs of use. Dell Inspiron E1705 3GB Ram, 250 GB HDD 17"
Condition is New unused. Box was opened to verify contents. Specs of the Dell Inspiron e1705. T he Photo actual unit are from the Dell website. User Input: Touchpad. Hard Drive: 100GB 7200RPM SATA (Hitachi TraveStar). This is internet ready, Wifi works great. TOSHIBA L675D 17.3" 500GB, AMD PHENOM II 2.90GHz, 4GB Win 7 (#152937792130). Works GOOD. There are very slight scratches on the back cover and front bezel. TOSHIBA L675D 17.3" 500GB, AMD PHENOM II 2.90GHz, 4GB Win 7 (#152937792130). Works GOOD. g 2 ( 23. Excellent u v ( 28. Nice unit, one of the best deals I've had recently a 8 ( 110. ). Laptop is in good working condition with WIn 10. Sold as is. Dell chager. USB ports, VGA port, DVI port. 17" screen. OFfice 2007. Dell Inspiron E1705/Core2Duo T5500 1.66ghz/3gb/60gbHD/Windows 7 Ultimate/BT/17"
CORE2DUO T5500 1.66GHZ PROCESSOR. T5500 MAKES GREAT VIDEO AND SOUND ON 17'. 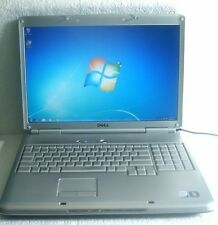 Hello, Up for sale is Dell Inspiron E1705. Silver panel. DELL E1705. DELL OFF049 VER 03 MOTHERBOARD. WINDOWS 7 ULTIMATE 64 BIT. 5 out of 5 stars - Dell Inspiron E1705/Core2Duo T5500 1.66ghz/3gb/60gbHD/Windows 7 Ultimate/BT/17"
1 product rating1 product ratings - Dell Inspiron E1705/Core2Duo T5500 1.66ghz/3gb/60gbHD/Windows 7 Ultimate/BT/17"
Up for sale is a Dell Precision M6400 laptop. The machine is running a clean installation of Windows XP SP3 with all drivers installed. This system has a large 17" LCD, high-end NVidia graphics, and a built in Webcam! Works well. We will do our best to rectify the issue. Dedicated 3GB GDDR5 NVIDIA GeForce GTX 1060 Graphics. There are also built-in speakers utilizing Bang & Olufsen Sound technology. Graphics Dedicated 3GB GDDR5 NVIDIA GeForce GTX 1060. Native Resolution 1920 x 1080. Hp Pavilion dv9815NR Turion 64 x2 2.00ghz / 3GB RAM /250GB HDD Geforce 7150M 17"
It has been tested and is fully functional. It has a 64-bit processor so it can use newer OSs if you would want to upgrade it. The DVD drive is not detected by the OS or the BIOS. The hinge is tight and the keyboard and touchpad work great. HP Pavilion dv9500 17" Core 2 Duo-T7700 @2.4GHz 3GB RAM 250GB HDD Win vista. Condition is Used. Shipped with USPS Priority Mail. Toshiba P205D-S7802/Amd Turion 64x2 TL-58 1.90ghz/3gb/160gbHD/Windows 7 Ult/17"
AMD TURION 64X2 TL-58 1.90GHZ PROCESSOR. TOSHIBA P205D. Hello, Up for sale is Toshiba P205D-s7802 with White keyboard. TOSHIBA JASAA MOTHERBOARD. WINDOWS 7 ULTIMATE 64 BIT. MATSHITA UJ-850S DVD BURNER. Basically Laptop is/was working well. PICTURE: Usually what you see in the picture is what you will get. Don’t have any idea or information who used this Laptop before. HDD wipeout and reinstall OS. This laptop runs great! installed with all basic software needed, free anti-virus and office suite! Product Information. - We usually use one of the following services Hardware PlatformPC. Item model numberM685-E.
HP PAVILION dv9912nr Laptop. CD/DVD SuperMulti DL Optical Drive w/Lightscribe. For Parts or Repair. Burn mark on LCD. NO AC adapter. NO HDD (Has caddy). Good Hinges. Non-original Battery. This is internet ready, Wifi works great. TOSHIBA L675D 17.3" 500GB, AMD PHENOM II 2.90GHz, 4GB Win 7 (#152937792130). Works GOOD. The device is all cleaned up, tested, and ready for your information.